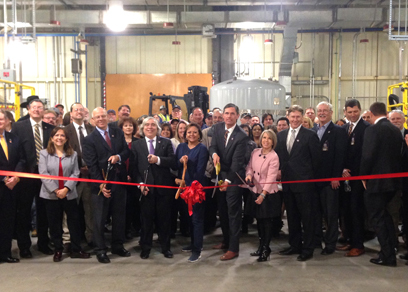 After nearly three years shuttered, the Waste Isolation Pilot Plant (WIPP) held a ribbon-cutting ceremony Monday celebrating its grand reopening. The ceremony was attended by Gov. Susana Martinez, Department of Energy Secretary Dr. Ernest Moniz, Sen. Martin Heinrich, Rep. Steve Pearce, Rep. Michelle Lujan Grisham, and a number of other local, state and federal officials. The contingent also received an underground tour of the WIPP site. “As WIPP moves forward, I want to continue working with the federal government to ensure the safety and success of LANL (Los Alamos National Lab) and WIPP,” Martinez said. The WIPP, a geological repository located in southeastern New Mexico’s nuclear corridor about 26 miles east of Carlsbad, is tasked with the permanent disposal of radioactive waste from military nuclear weapons testing. In 2014, two isolated incidents forced its closure. On Feb. 5, 2014, a salt haul truck caught fire in the underground facility, causing six workers to be taken to the hospital for smoke inhalation. Ten days later, the facility’s air monitors detected high radiation levels in the air due to a damaged drum holding radioactive waste. At least 17 workers were contaminated but no acute radiation poisoning was evident. According to the New Mexico Environment Department, the cause of the radiological leak was determined to be the result of “an unauthorized switch of clay-based kitty litter absorbent to an organic kitty litter absorbent” in a barrel packed by LANL. After two years’ worth of discussion between the NMED and the DOE, a $74 million settlement of the state’s claims against the DOE was reached. The money is being used to fix roads taken by TRUPACT container transports surrounding the WIPP, as well as to update the area surrounding LANL and emergency protocol for the WIPP. This settlement also helped ensure that containers of waste that were being both shipped from LANL and received at the WIPP would be inspected extensively for any damage before being placed in the underground mines of the facility. After the 2014 incidents, a recovery team was called into the WIPP, which included Jeffrey M. Carswell, the Acting National Transuranic Program Recovery manager, and Jim Blankenhorn, the Nuclear Waste Partnership Recovery manager, as a measure to ensure the WIPP’s future reopening. On Dec 16, 2016, the NMED’s Hazardous Waste Bureau regulators completed an inspection on behalf of the WIPP, and the repository was cleared for reopening on a limited basis. “WIPP now being reopened, and, in a few months, getting shipments started, is also going to be an enormous step throughout the entire DOE complex,” said Moniz. Congratulations and many thanks were extended to the WIPP’s workforce for their continued service and dedication by each speaker. Pearce added onto that statement, saying that without stability throughout the chain of command, “this stunning, stunning, high-wire act” would never have been accomplished. The press corps was also able to tour the underground of the WIPP facility, walking through the new safety measures, such as limiting the amount of TRUPACT containers loaded into the mine from the surface per week, starting at one shipment and slowly working back up to five shipments by the end of the year, and the new ventilation system still under construction. To eliminate any questions about the safety of the mine, maintenance is done on the shafts four days out of five, and the WIPP overcompensated on the amount of bolts keeping the salt slabs from crumbling into the mines by around 250 percent. New fire protocols, including stricter rules regarding the use of liquid-fuel vehicles, are similarly being followed. Martinez said she felt secure enough with the precautions that had been put in place since the incidents to go into the mine herself and to allow employees to return to work. “The Department of Energy’s whole future depends on successful operation here at WIPP,” said Moniz.